How To Appreciate Customer Loyalty With Wristbands? Custom silicone bracelets are the best way to appreciate your customer loyalty. April is Customer Loyalty Month, but any successful company likely already makes customer appreciation part of their everyday business philosophy. Marketing experts agree that it takes much more effort to gain a new customer than it does to get repeat business from existing customers. April is a good time to remind your customers how important they are to you. 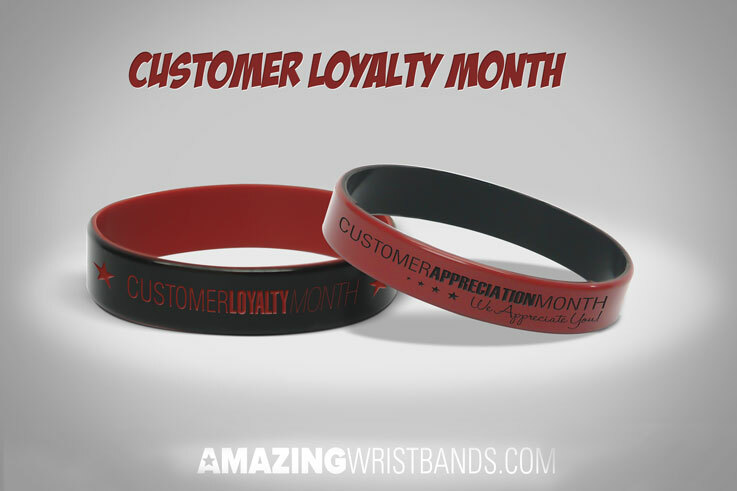 Customer loyalty wristbands are a great marketing tool to celebrate Customer Loyalty Month. How Can Wristbands Help with Customer Loyalty? You can create personalized rubber wristbands with your company’s logo, tagline, web address or other custom message. Give company bracelets away to your regular customers to show them you appreciate them. You might even want to tie the wristbands to a month-long promotion – such as a free gift or special discount to anyone who comes in wearing the wristband during the month of April. Empower employees to solve customers’ problems. Create a brand promise, post it in your location, and live by it. Get employees excited about working for you. Happy employees = happy customers. Create your customer loyalty awareness wristbands today!